the Royal Victorian Order, 1953; appointed Knight Commander of the Royal Victorian Order, 1977. Died 8 June 1979, in Windsor, Berkshire, England. Silver and Gold, London, 1955. Royal Courts of Fashion, London, 1971. Brighton Art Gallery, Norman Hartnell (exhibition catalogue), Brighton, 1985. Kennett, Frances, et al., Norman Hartnell, 1901-1979 (exhibition catalogue), London, 1985. McDowell, Colin, A Hundred Years of Royal Style, London, 1985. Wyndham, Francis, "The Pearly King," in Vogue (London), September 1960. Glynn, Prudence, "Hartnell: The Norman Conquest," in The Times (London), 6 January 1977. Sinclair, Serena, "For Sir Norman, At Last, a Royal Reward," in the Daily Telegraph (London), 10 January 1977. Hassian, Nicky, "Sir Norman Hartnell," in Ritz (London), No. 3, 1977. Laurance, Robin, "But Will Sir Norman Arise?" in The Guardian (London), 2 March 1977. Scroggle, Jean, "The Norman Conquests," in Homes and Gardens (London), June 1985. Hoare, Sarajane, "Relaunch of Ready-to-Wear at Hartnell," in The Observer (London), 9 March 1986. McDowell, Colin, "The Rise of the House of Hartnell," in The Guardian (London), 13 March 1986. Williams, Antonia, "Hartnell Then and Now," in Vogue (London), August 1986. Hume, Marion, "Heart to Hartnell," in Fashion Weekly (London), 15 January 1987. Brown, Malcolm, "Trading Places: Peter Moss, Moss Brothers; Manny Silverman, Norman Hartnell," Marketing, 3 December 1987. 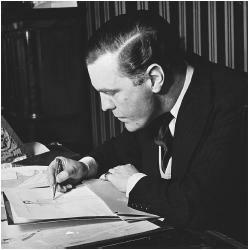 Norman Hartnell began his fashion career working as an assistant to extravagant society couturiére Lucile. Through his exposure to this rarefied world of fashion, gossip, decoration, and illicit romance, he was inspired to open his own dressmaking business in 1923, establishing what became one of the best-known and longest-running couture houses in Britain. Situated in the heart of London's Mayfair, the house on Bruton Street always had an air of splendor. A graceful staircase, panelled with mirrors, led up to the splendid salon where gilt mirrors and two giant crystal chandeliers created an air of tranquillity. Seated on their gilt-encrusted chairs, society hostesses, actresses, film stars, debutantes, and royalty watched countless collections float elegantly by. The early collections shown in both London and Paris quickly established Hartnell's reputation for lavishly embroidered ballgowns in satin and tulle, fur-trimmed suits, and elegantly tailored tweed day ensembles. His first wedding dress fashioned from silver and gold net was a showstopping finale to an early collection and was described as "the eighth wonder of the world" when worn by the bride of Lord Weymouth. Other early commissions included a 1927 wedding dress for romantic novelist and socialite Barbara Cartland, and informal clothes for actress Tallulah Bankhead who scandalized 1920s London with performances both on and off-stage. Hartnell's clothes often stood apart from fashion, owing a greater allegiance to costume; this was no doubt fueled by his early experience designing theatrical productions while at Cambridge University. He drew inspiration from the saucy French paintings of Watteau and Boucher, purity of line from Italian masters like Botticelli and painters such as Renoir and Tissot for what he described as a touch of "chi chi." Summoned to Buckingham Palace on the succession of King George VI to discuss designs for the coronation dresses of the maids of honor, the King led Hartnell through the hall of Winterhalter portraits. This gave him the inspiration for the crinoline dresses that later become a symbolic royal look for the two monarchs—Queen Elizabeth the Queen Mother and Queen Elizabeth II. The dresses also influenced the silhouette of Dior's New Look of 1947, a line that came to epitomize a postwar return to femininity. Hartnell was officially appointed dressmaker to the royal family in 1938 and subsequently designed for various royal occasions, eventually being acknowledged for creating a stylistic royal image that remains today. He was responsible for both the wedding dresses of Queen Elizabeth II and Princess Margaret. In 1953 he created the Queen's historic coronation dress, embroidered with the emblems of Great Britain and the Commonwealth. In the late 1990s and early 21st century, the House of Hartnell was still responsible for the personal wardrobe of the Queen Mother. It could be argued that Hartnell limited himself as a designer by his work for British royalty and aristocracy. He created to promote and protect an establishment, encasing it in a grandiose aura of ornament and glamor, a service honored by a knighthood in 1977. It should be remembered, however, that Hartnell also produced ready-to-wear collections, sold through department stores from 1942 onwards. He also designed for Berkertex and created the uniforms of the British Red Cross and the Women's Royal Army Corps during World War II. Although Norman Hartnell died in 1979 his legacy was continued in the early 1990s by French couturier Marc Bohan. Bohan designed haute couture and ready-to-wear collections and successfully maintained the Hartnell name for a few years, but the recession of the early 1990s soon took its toll. Norman Hartnell closed its doors in 1992.